Who hasn’t heard a great story about businesses or bands that started in a garage? It is the ultimate American success story to say you started out in a garage, working up to a household name. Names like Microsoft, Apple, Amazon, and even Harley Davidson started in the dank confines of the family garage. The garage is truly a magical place full of lore and history, one of the 20th century’s greatest incubators of change. At G&G Garage Door, we salute all of the legends of the garage everyday. You could say that we even started in a garage, just maybe it had a custom wood garage door with a LiftMaster Elite Series opener. If you are in the market for a new garage door, you are in luck, because we are the most trusted garage door repair, installation, and maintenance contractor in Torrance. See? We are just another household name that started in a garage. This is not at all the definitive model of how to start a multi-billion dollar company in your garage, think of it as a little bit of inspiration, not a blueprint for success. The reason being is that a startup, garage based or not, is that a large majority of the businesses fail. In fact, one of the numbers floated around consistently is 90 percent of startups fail in the first year. This could not possibly be the case right? For every Amazon there are probably five hundred failed attempts to do something similar. The brilliant part of the entrepenurial population is their unwillingness to give up, the tenacity to make it at all costs with risk factors looming at every turn. You may be asking, “why would anyone want to start a company in their garage if it is just going to fail?” Well, there is always the chance that your idea is ready to explode onto an unexpected world, making it big. But if the stars are not aligned just perfectly the whole operation crumbles into a pile of ash. If you are in fact starting a business out of your garage, we would recommend one of our coachman collection garage doors from our premium collection. They are the perfect blend of class and sophistication, and the windows are good for ambiance. It’s the fundamental lesson in just about every children’s cartoon — never give up. The mantra for a million business owners out there when things get tough. In order to succeed in a garage start up, one of the main characteristics you have to have is the spirit to forge ahead, no matter what is in your way. They say Steve Jobs was like that, nothing was going to get in the way of his success, and we mean nothing. Say what you want about that type of drive, but it appears to work. In fact, most super successful people have similar mindsets. Doesn’t that make you want to clean out those old Christmas lights and learn HTML? No matter how hard you may try, your garage based business may fail and that is OK, sometimes life just deals you a tough hand of cards. The only thing to remember is to have a backup plan. It doesn’t have to be anything extravagant or extensive, but knowing you have something to fall back on in case of your startup not working out is one of the best ways to succeed. If you are going to work out of your garage, it is a good idea to get out once in a while and talk to actual humans. Preferably humans that can help elevate your business. Find a group of fellow entrepreneurs that you can bounce ideas off of and empathize with through difficult times. Networking is critical for any business, in fact it can help it grow at a fast pace, which is obviously what you want. Also if you spend all of your time locked in your garage, you will never connect with potential customers. It is best to find people that can stand hanging out in a garage for hours a day. Legend has it the Apple guys put together 50 computers in 30 days in their garage. The condition of the garage is rarely commented on, but one thing is for sure, it was a place that allowed great things to happen. They did it as a team and no entrepreneurial garage start up would be anywhere without a great team. Surround yourself with people that drive your success and do not mind sitting next to the trash can in the corner. Also treat your people with the respect they deserve, regardless of whether your garage startup works or not. The easiest way to make your startup successful can be boiled down to one word. Luck. Luck is the sure fire way to become a household name. Being in the right place at the right time is the next best way to have a multi-billion dollar company. As hopeless as it may seem, it is really not that bad. Not all businesses have to become a big as some of the garage startups, and as we said before, the odds are against success anyway. Focusing on what you’re good at and providing the customers with a positive experience is the best way to find success When G&G Garage Doors hit the opener more than 30 years ago we made a commitment to our customers and that commitment continues to this day. 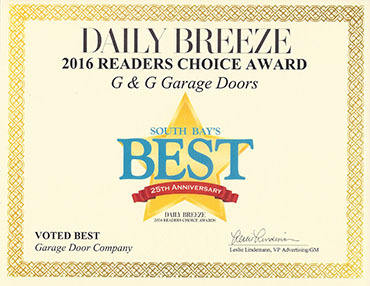 We take great pride in our community and the fact that we get to make it a little better with our wide selection of garage doors. 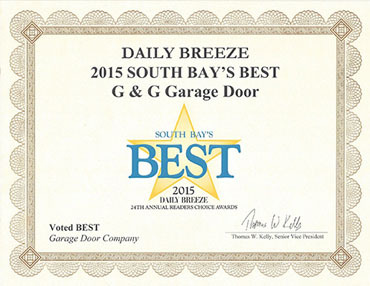 You can see our garage doors from Long Beach to Hermosa and that gives us great pride. It has been a labor of love for us and we have enjoyed the journey to this point. Striving to be the best garage door contractor in the area is our main goal and we can only achieve that level of success with loyal, happy customers. 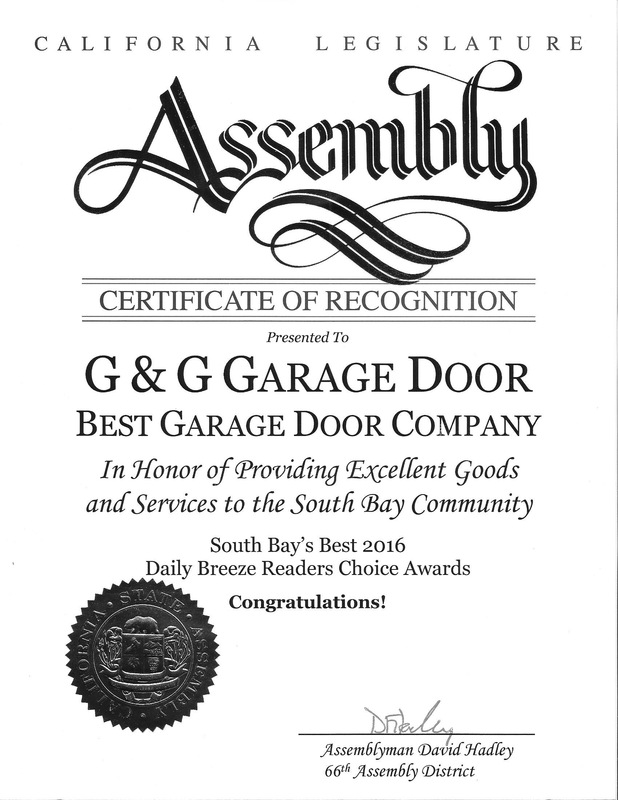 At G&G Garage Door, we are proud to serve the garage door repair, replacement, and maintenance needs of our community. If you need a new look for your home, a new garage door opener, or simply want the rollers to stop squeaking, do not hesitate to contact G&G Garage Doors. If you are in fact starting a business out of your garage, give us a call, maybe we will even tell you a bit about how we became garage door legends.